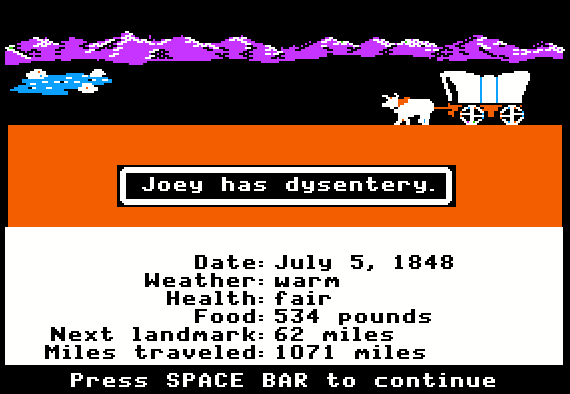 The Oregon Trail is arguably the most famous educational computer software game ever created. For several years in the 1980s, it was the most commonly found software program in the schools of the United States and Canada – as well as being quite popular in the home market. The tremendous popularity of the game continued throughout the 1990s, driven in part by a new version in 1995 called Oregon Trail II. However, the history of the game goes back even farther, dating back to its original invention on a timeshare computer system by Don Rawitsch and two colleagues in 1971. This story looks at that original text-only version of the game, along with the earliest Apple II version, which was also text-based. 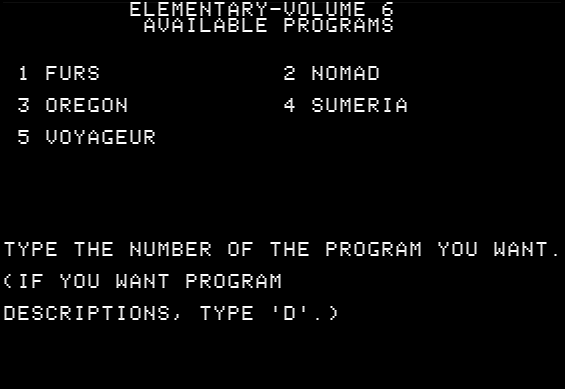 In its earliest incarnations, back in the 1970s, The Oregon Trail – then called simply OREGON – ran on a mainframe computer in a timeshare environment. To play the game, you sat at a teletype machine and dialed in (using a telephone and a modem) to the remotely located mainframe. All of the communication between the user and the mainframe was done via text. 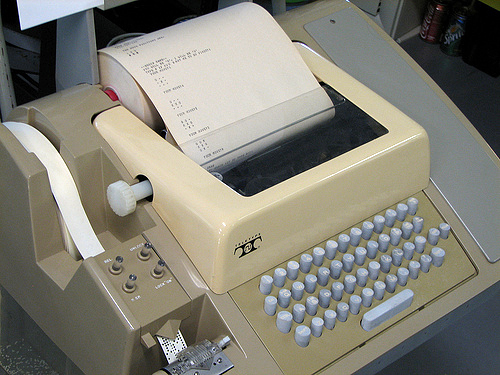 When the user typed something on the keyboard, the computer would receive the message through the phone line and pass it along to the OREGON program. After a few seconds the program would send a response back through the phone line, which the teletype would print on the paper. At that time, most mainframe computers that were accessible to students were located on university campuses. But Minnesota was unusual in that it set up a timeshare system in 1974 exclusively for the use of Minnesota public schools – via a newly created state agency named MECC (the Minnesota Educational Computing Consortium). Most of the instructional programs that ran on the system were not particularly game-like, but a few of them were. One game – OREGON – stood out as being especially engaging to students. However, the story of the original OREGON goes back even farther, before MECC was even created. It goes back to 1971, and a young student teacher named Don Rawitsch. In 1971 Don Rawitsch was a 21-year-old college student majoring in history at Carleton College in Minnesota. At the same time, he was taking the required education coursework to become certified as a teacher. One requirement of the program was to spend time as a student teacher. Don’s assignment was to teach American history at a local junior high school. As he looked over the upcoming lesson schedule, he saw that it included a unit on America’s westward expansion in the 1800s. As he thought about creative ways to teach this unit and engage his students, he came up with the idea of a board game based on the Oregon Trail. Don shared an apartment in Minneapolis with two other Carleton student teachers, Bill Heinemann and Paul Dillenberger – two math majors who also taught in the city schools. Both Bill and Paul had learned how to program computers using BASIC, so when the three of them began to discuss Don’s concept for a board game, they soon decided to create a computer-based game instead. But time was tight – Don needed to have the game ready in just two weeks. Bill and Paul did the programming at night on a teletype machine at the junior high school where they taught. The teletype allowed them to connect to a mainframe computer that was operated by the Minneapolis school district. Two weeks later, in December 1971, Don was able to try out a first-draft version of the Oregon Trail game with his students. To play the game on the school’s teletype machine, Don divided his class into teams. Each team got a chance to play the game, one team at a time. The game still had bugs, which became evident as the kids played, but the young players were enthusiastic anyway. In fact, students continued to play the game, on their own time, for the remainder of the semester. But when the semester ended, Don deleted the game from the timeshare system. For a while, that was the end of the Oregon Trail computer game. Don graduated from Carleton in 1972, and began work at the Minneapolis schools. A year later, in 1973, the MECC was created by an act of the Minnesota legislature. In October 1974, MECC hired Don to join its small but growing staff. Don soon learned that MECC was looking for educational software programs to install on its new timeshare system. These programs would be available to teachers and students all over the state of Minnesota. Don thought that a resurrected version of the Oregon Trail game might be a helpful contribution. Luckily, he had saved a copy of the BASIC program code, printed out on teletype paper. During the Thanksgiving holidays in 1974, Don typed the program in, line by line, and saved it to the MECC timeshare system. Finally, in 1975, he made the program available to everyone on the MECC system. And so, four years after Don, Bill, and Paul first conceived of OREGON in 1971, the game was finally available to a large audience. For the next 8 years, until MECC’s timeshare system was shut down in 1983, OREGON remained the most popular program on the system. 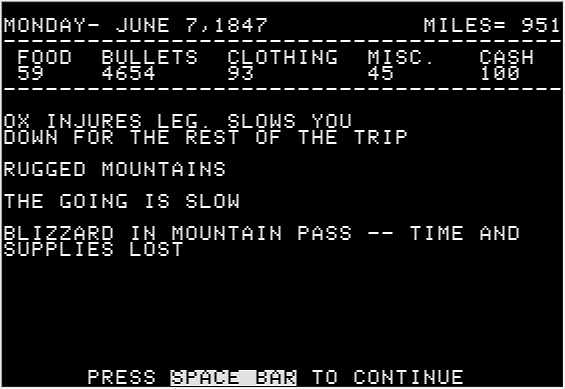 Below are excerpts from a round of play on MECC’s original timeshare version of OREGON, played on a teletype machine. In this example, the player successfully reaches Oregon after 14 turns of play. The first turn always begins on March 29, 1847, and represents a 2-week period. Thereafter, each turn begins at two-week intervals, until the player either perishes or reaches Oregon. This turn began with two decisions – 1) whether to hunt, and 2) how well to eat. Then two “misfortunes” occurred – an attack by hostile riders, and a bad illness. The player quickly and correctly typed “BANG” when told to do so, thereby succeeding in driving off the riders. 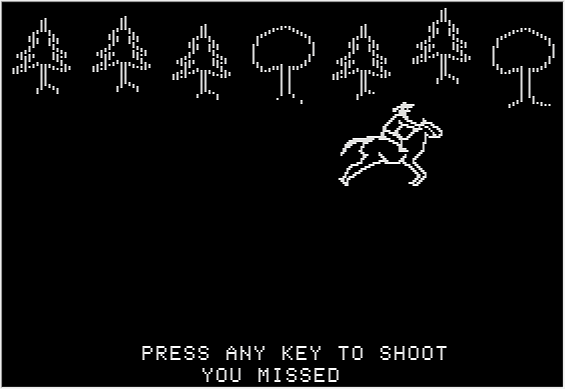 This time the player has chosen to hunt, but mistyped the word “BANG”. Then bandits attacked, and again the player mistyped “BANG”. Mistyping was quite common, because the player has only a couple of seconds to type the word – otherwise he loses the chance to shoot.